[Upcoming Event] HI-5 HOUSE HITS 2014 LIVE IN MALAYSIA! TICKET LAUNCH ON THIS WEEKEND! 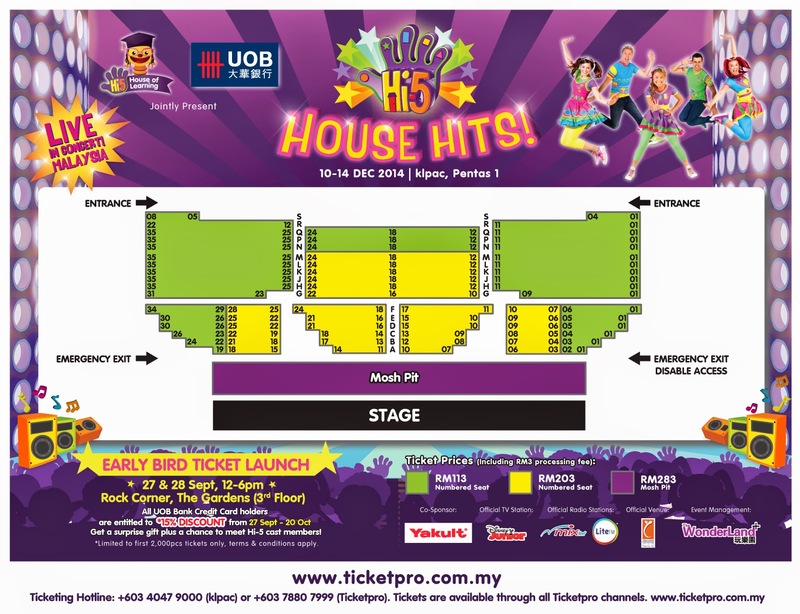 Kuala Lumpur, 26th September 2014 – Hey all, Hi-5 fans, they are coming back to Malaysia again, for a spectacular new show - Hi-5 House Hits 2014 - on 10 to 14 December 2014 in The Kuala Lumpur Performing Arts Centre (klpac) and there will be a total of 9 shows. The children’s musical group guarantees to bring an amazing sing-and-dance performance that can be enjoyed by children and parents alike. *The prices listed above includes RM3 Ticket Pro handling fees. After the sold out show last year, they are returning to Malaysia again. This time Hi-5 House Hits 2014 will be featuring classic hits such as “L.O.V.E”, “Ready or Not” and “Give 5”, as well as some brand new catchy tunes! The all-Australian cast of Stevie, Ainsley, Mary, Dayen and new member, Tanika will put on their dancing shoes and sparkle on stage. Besides, audience can also expect to enjoy Hi-5’s easy-to-learn dance moves, catchy songs and party games for a truly unique up-close and personal experience even better than on TV. Chats and Jup Jup our puppets friends, will be joining the fun as well! Chats will be bringing surprises to the audience and children can have a chance to be a Star of the show, while Jup Jup will also be making a tricky appearance. 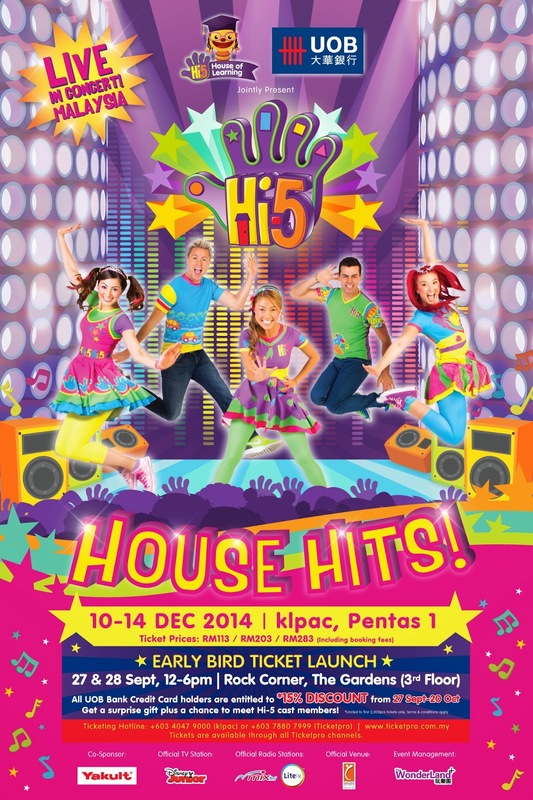 Hi-5 House Hits 2014 is definitely going to be a fun-filled event for the whole family. Hi-5 Operations welcomes all children and parents to join in on the fun at Hi-5 House Hits 2014. To please all the fans, we are happy to announce that the early bird tickets will be launched only on 27th & 28th September (Sat and Sun) at Rock Corner, The Gardens (3rd Floor) from12pm to 6pm. All UOB Bank Credit Card holders are entitled to 15% discount during the early bird launch. First 300 tickets purchased from each ticket categories will be rewarded with special gift such as Hi-5 merchandises, posters and many more. Also, all tickets purchased during the launch will stand a chance to win passes to meet hi-5 cast! All UOB Bank Credit Card holders are still able to enjoy the 15% off all tickets from 29th September to 20th October through all Ticketpro channels, limited to the first 2,000 tickets purchased using the UOB Bank Credit Card only. For more information do visit www.ticketpro.com.my or ticketing hotline at +603 4047 9000 (klpac) or +603 78807999 (Ticketpro). What are you waiting for? See you there! Hi-5 House Hits 2014 is jointly presented by UOB Bank and Hi-5 House of Learning, Co-Sponsor Yakult, Official TV Station Disney Junior, Official Radio Stations Mix and Lite FM, Official Venue klpac and Event Managed by The WonderLand+.